Downtown Boulder is uniquely beautiful, sitting in the shadow of the Flatiron Mountains and next to crystal clear Boulder Creek. Filled with unique shopping, dining, and entertainment downtown Boulder has an energy all of it's own. Just 30 miles from Denver, Downtown Boulder is a must see. 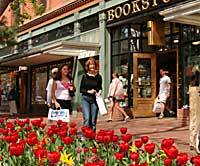 The heart of downtown Boulder is the outdoor Pearl Street Mall - a four-block-long pedestrian mall where street performers rub elbows with bankers and tourists. Downtown Boulder holds events year round including holiday celebrations, art shows, and great musical performances.